If you are looking for a full-size Suburban that has a spacious interior, tons of fabulous features and impressive performance capabilities, you may be hard-pressed to find a more suitable option than the 2019 Chevy Suburban. This model has been offered continuously since 1935, and it is currently in its 11th generation. Compared to last year's model, you may notice that the LS trim now has an optional OnStar feature when HD radio is removed. In addition, all trims now include Shadow Gray Metallic as a replacement for Havana Metallic and Tungsten Metallic. By contacting our Chevy sales team today, you can learn more about changes and carryover features for the 2019 Suburban. Before driving home in your new 2019 Chevy Suburban, you will need to choose a trim and decide which options and packages you want to add to it. The 2019 trims are the LT, LS and Premier, and these are all available in a 2-wheel or 4-wheel drive option. 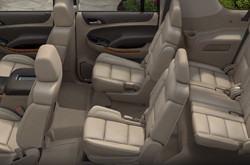 There is also variation in seating configuration, so the Suburban can accommodate seven or eight adults. 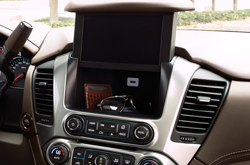 A few of the many features that may be in your Suburban include manual folding or power-folding rear seats, a wireless hotspot, leather or premium cloth material, a rear vision camera, a driver alert package, power-adjustable pedals, an auto-dimming rearview mirror, power windows, a tri-zone climate control system, remote keyless entry, a rear entertainment console with a Blu-Ray DVD player, an 8-inch display for the driver's info center, multiple power outlets, a theft deterrent system, six to 10 speakers, power door locks, a standard or Bose audio system, a window wiper and defogger in the rear, a navigation system, standard or advanced cruise control, a Chevy infotainment system paired with an 8-inch color display screen, wireless charging, a leather-wrapped and heated steering wheel with multiple mounted controls and a few additional features. Our Chevy sales team is eager to tell you more about the standard features and optional packages available for your new Suburban. The new Suburban for 2019 is well-equipped under the hood and provides a stellar driving experience regardless of road conditions. The base powertrain for all trims is a V8, EcoTec3 5.3-liter gas engine that comes with direct fuel injection, Active Fuel Management, an aluminum block and variable valve timing. It is capable of producing up to 355 horsepower along with 383 pounds-feet of torque. An upgraded 6.2-liter version of this engine is available when more power is desired. 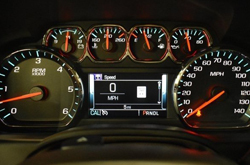 Additional features impacting the performance of your new SUV include an integrated trailer brake controller, a limited-slip rear differential, an engine block heater, 4-wheel anti-lock brakes, a Premium Smooth Ride suspension system featuring an optional air leveler and magnetic ride control. A 6-speed auto transmission is standard for all trims, and a 10-speed auto transmission is available as an upgrade with higher-level trims. Will The 2019 Suburban Keep My Family Safe? 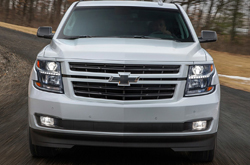 Remaining safe on the road is a serious concern, so you will be pleased to learn that Chevy has outfitted the 2019 Suburban with an extensive selection of quality safety features. Some of the standard equipment or optional features available include rear and front parking assistance, a tire pressure monitor, daytime running lamps, warning tones, auto braking with a forward collision alert, electronic stability and traction control, the LATCH child safety system, a teen driver mode, multiple airbags paired with a Passenger Sensing System for the front passenger, OnStar capability, low-speed auto braking for forward motion, a rear cross-traffic alert, lane keep assist with a departure warning, side blind zone monitoring with a lane change alert and several additional safety features.